Eden Hazard 's solo goal for Chelsea in their 3-1 home win over Arsenal in February has been votedvGoal of the Month. double Chelsea lead on the afternoon of Saturday, February 4. That goal got the highest vote from a panel of experts and the public beating Danny Drinkwater' goal for Leicester City against Liverpool and Burnley's Robbie Brady. "It is one of the best Premier League goals I have scored for sure," Hazard said. came close to the goal and in the last 10 metres, I was alone .
" When the ball went in I felt that I created something special so I was happy. " 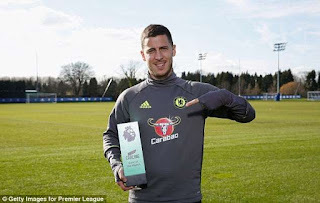 0 Response to "Eden Hazard Wins Premier League Goal Of The Month With Amazing Solo Goal Against Arsenal"